These Alpaca Shoe Inserts are a bit over ¼” thick. Made from a cross layered 100% felt, these insoles will last and last. Alpaca shoe inserts wick away moisture, keeping your feet dry and happy. Can be easily trimmed with scissors if needed to fit any shoe size. You support alpaca farms by purchasing these USA grown and made insoles. 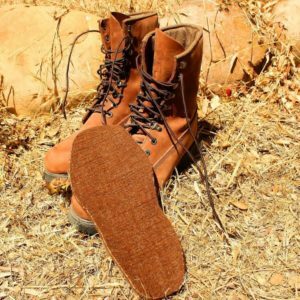 The alpaca shoe inserts (insoles) are made from natural alpaca fiber grown and crafted in the USA! They will keep you WARM and COMFORTABLE – from the bottom up! Works well in outdoor boots, indoor shoes and even slippers! Comfortable year round!